Most slopes are safe from avalanches today, but this does not mean small avalanches are impossible. At lower elevations, you may be able to trigger small wet avalanches where the snow becomes wet and cohesionless. Slopes with thin snowcover or exposed rocks outcroppings and vegetation are where you are most likely to find these conditions. These small avalanches will be harmless unless you are in very steep consequential terrain. Remember that even small avalanches can knock you down or push you into trees, rocks, or take you for a ride through chutes and gullies. Observers reported failing cornices, and those just on the brink in adjacent zones recently. Give cornices a wide berth as they can break further back onto ridgelines than you might expect, and try to plan routes that avoid travelling underneath them. We're starting out the day with mostly sunny skies across the Northern Mountains. Mostly clear skies last night, and below freezing temperatures above 10,000 feet means we will start the day with a good solid surface freeze. Daytime highs today don't climb much past 40 degrees, and a storm system churning to our south and west will lead to increasing cloud cover this afternoon. The upshot is that wet avalanche activity should not be an issue today. That said, you still might find wet punchy snow in low-elevation areas, particularly those in sheltered timber. Any wet sluffing will be small and not really a problem unless they shove you into trees, rock, or gully features. The main hazards today are afternoon thunder and lighting, and the threat from destabilizing cornices. Observers reported multiple cornice failures from around the state recently, including this one from Straight Creek yesterday. Many ridgelines still harbor large overhanging cornices that are creeping towards failure. 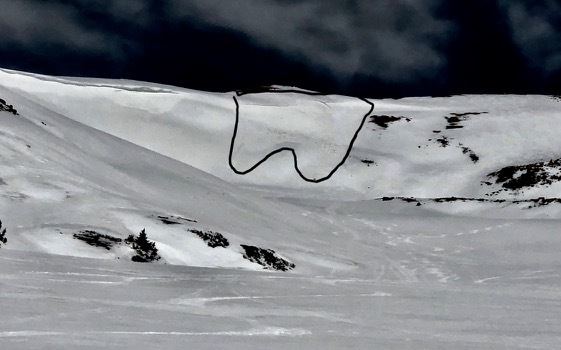 An observer near Loveland Pass yesterday shot this illustrative video of a cornice slowly cracking off the ridgeline. This is a great example of what to avoid. These features can break further back onto the ridgeline than you might expect, and it's not always easy to tell where safe ground is. Just give them a wide buffer, and avoid routes that travel underneath these large masses of snow.